It’s Friday again, and I have some random thoughts which I will now share. 1.) In addition to the old rubber stamp set, I also found this vintage child’s chair while antiquing on Wednesday. AND the sweet little tea kettle, which I placed beside a regular sized one. They both have the same shape spout. You just know “that ol moss” will soon be planted in that little one, too. 2.) 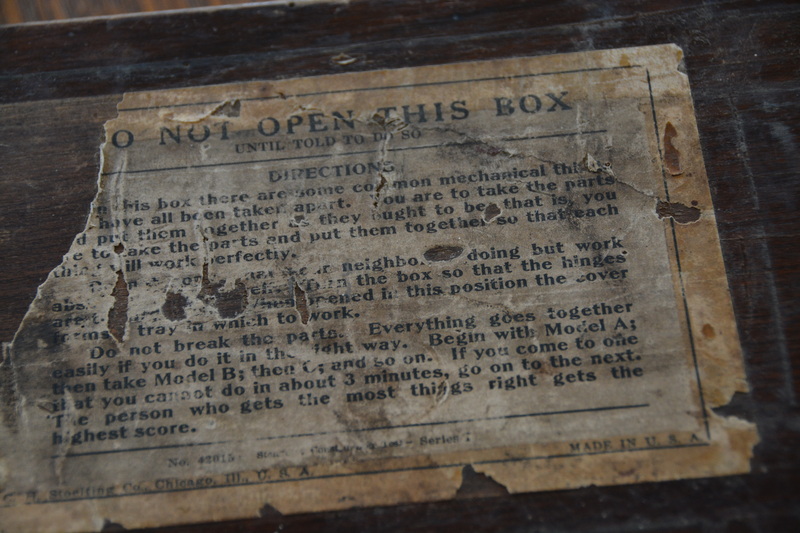 And speaking of the rubber stamps, Marshall began researching that wooden box they were in. He’s still investigating, but it seems that it was a kit used in some sort of testing. And, as you can see by the label, it was made by the C. H. Stoetling Company. Best of all, it was made in the U.S.A. If we find out more about it, I’ll let you know. 3.) The swans have been visiting us for several years, and Groom Swan is definitely the friendlier of the two. 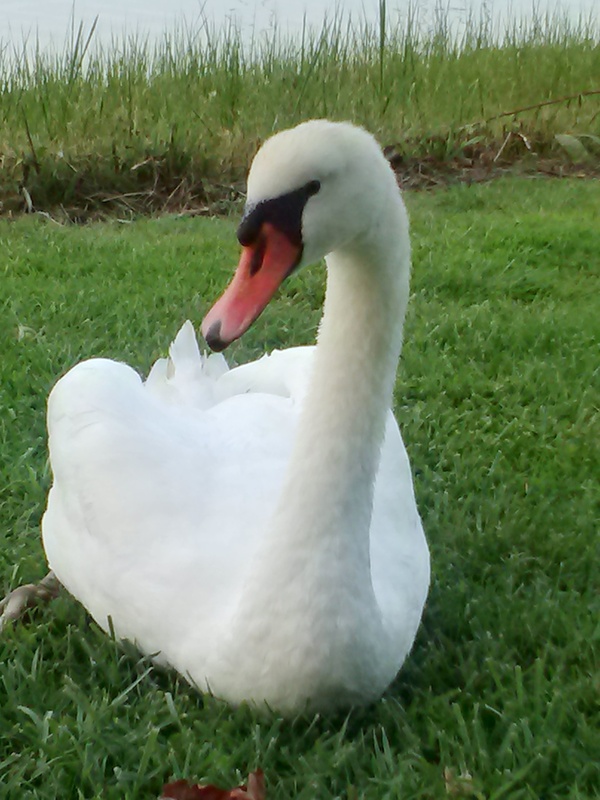 Bride Swan has always been a bit aloof, although she does let me get fairly close to her when she’s in our yard. But one day last week, she actually took about four steps toward me. And allowed her photo to be taken. 5.) And last (AND least, as far as pleasantries), Motor Man and I both have dental appointments today for fillings. You just know how much we’re looking forward to that. Feel free to share your randomness, and, hopefully, yours doesn’t include the dentist. This entry was posted in Days at Home, Sunrises/Sunsets, The Swans, Traveling Days and tagged dental appointment, old rubber stamp set, sunrise, tea kettle, vintage childs chair, white swan. Bookmark the permalink. Love all your finds antiquing. Seems like those items you brought home were waiting for you to claim them. Your finds were great at the antique hunt on Friday! Especially love the little chair! Love the close-up of the Bride Swan-beautiful picture. You know the females are the more demure of the two sexes (LOL). Finally, I hope you and JR get done quickly in the dental office-top of everyone’s list of least favorite. Have a great weekend and thanks for Friday’s enchanting post! Awww Bride Swan! You did well finding treasures. I just read, “gets the highest score” on the label for the box.. could be interesting. I see the dentist in October.. bah. 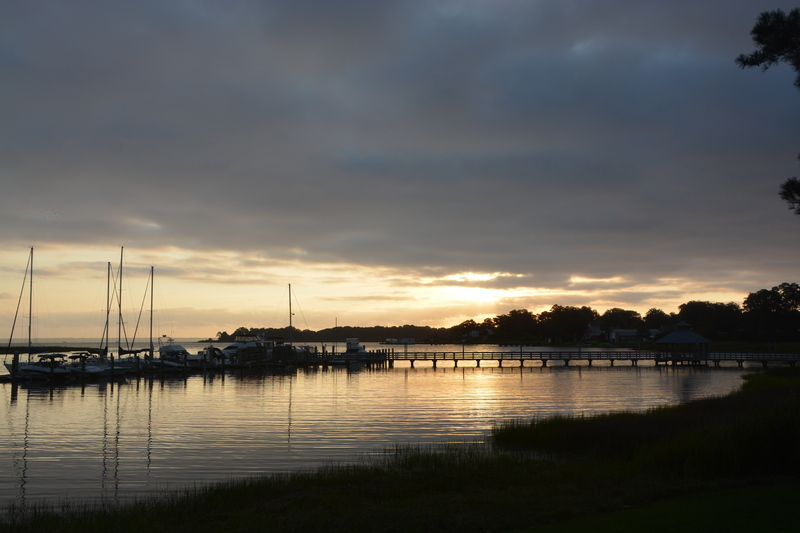 Very pretty sunrise photo. Enjoy your weekend! I miss the swans. Looks like “she” posed for this shot. What a diva! Good luck at the dentist and tell JR to be good! No dentist pranks! Great Randomness! You found such great stuff on our antiquing jaunt…can’t wait for Marshall to find out more about the “mystery box” the stamps were in! Oh, Bride Swan is so pretty and gracious for allowing you to get a ‘close up.’ Dental appointments? Yuk. Hate them. Great pic of Bride Swan! – glad shes finally decided it’s ok to get close ! I haven’t done any more research on the box yet, but will probably set out on that shortly ………..
Bride swan is so beautiful. I’m glad she’s warmed up to you some. You found some awesome treasures. It’ll be interesting to see what Marshall finds out about the box. I hope you have a good visit with the dentist. All the found vintage objects that you stumble across in piles in an antiques booth just add so much to the house and garden, I think. I can definitely think of more enjoyable things to do than the dentist, but I do appreciate good teeth! Hope it was a quick and painless visit. Love the pics and your plant/pot setting. 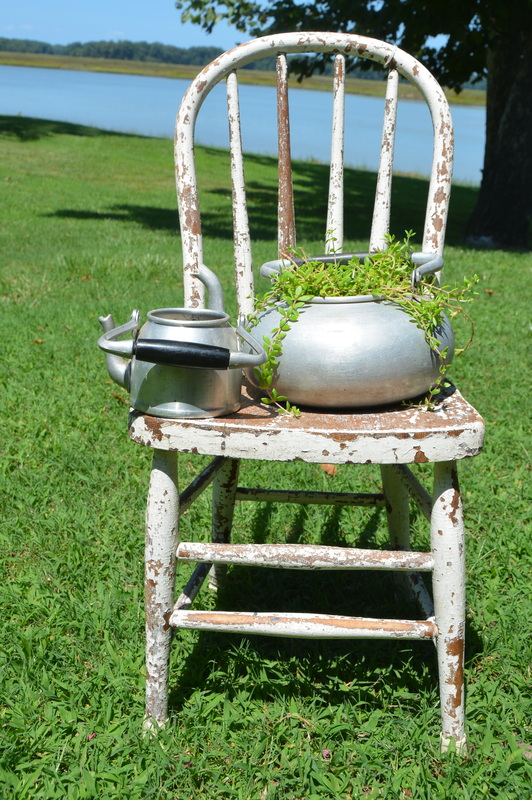 The child’s chair is a good find and the tea kettle looks cute with the big one. The bride swam is beautiful, great close up. Hope you and JR did OK at the dentist. Have a good weekend. The rubber stamp kit that you found is amazing. I hope that Marshall is able to learn more about it, so that you can share it with us. Bride Swan allowed you to get a lovely picture of her. You find the cutest things for your yard/garden.